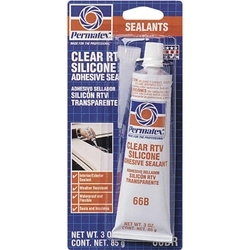 General-purpose, clear RTV indoor/outdoor sealant. Seals, bonds, repairs, mends and secures glass, metal, plastics, fabric, vinyl, weather stripping and vinyl tops. Protects and repairs electrical wiring. May be applied to horizontal or vertical surfaces. Waterproof and flexible. Temperature range -75°F to 400°F (-59°C to 204°C); resists oil, water, weather, vibration, grease.